Nexus has been used to directly integrate Solidwork, for the generation of the geometry, and Ansys CFX, to define and solve the CFD model. The search of the pareto-optimal solutions has been guided by Nexus implementation of Multi Objective Genetic Algorithm (MOGA). 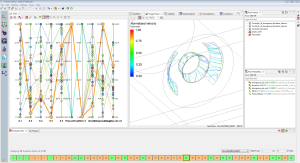 The pareto front, result of the optimization, has allowed the identification of two optimal geometrical configurations, the first one with an improvement of 10% in flow uniformity and the second one with a total reduction of 16% in pressure drop over the initial design.